You can be quick tempered. You will be happy as a writer, critic or publicist.
. [“Rat Pack”/LV Sun] Except for the “quick tempered” facet, this description of “Ratters,” reminded me quite a bit of the person I was having a long lunch with yesterday, while ringing in the Lunar New Year in downtown Schenectady, NY, a couple blocks from the landmark GE Sign. However, although he did order a cheese omelette, I can not confirm whether my pleasant luncheon companion is, indeed, a zodiac Rat. You see, he’s the infamously anonymous “Ed,” editor of Blawg Review. And, although he made a special stop in Schenectady — coming by Amtrak from LegalTech NY 2008 in Manhattan and heading to Buffalo to meet with clients — the mysterious Ed would not reveal his true identity. Naturally, I was truly honored that the man who gave f/k/a the Blawg Review “Creative Law Blog Award” in 2005, placed us on his ten-best blawg list last year, and has been our best long-distant proofreader and cheerleader for three years, made a stop in our humble little city, just to meet me. 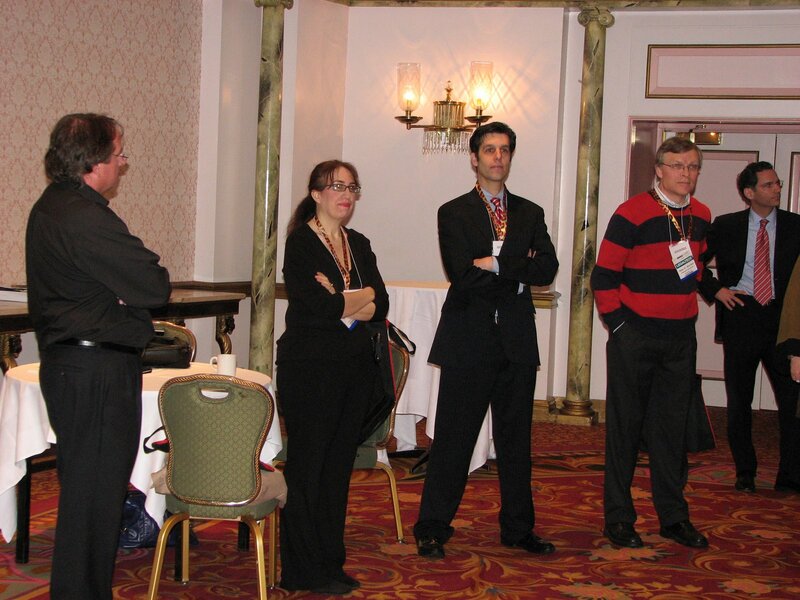 But, let’s be frank (in addition to the initial letdown when I realized Ed was not in fact Anne Reed of Deliberations weblog): I’m both disappointed and irked that Mr. Editor didn’t take me into his confidence and reveal his true identity. As I told Ed, “You’re the first pseudonymous lunch companion I’ve ever had.” And, let’s hope, the last. Although I understand how this Anonymity Thing started, and can sympathize with the almost-captive nature of the Anonymous Editor Mystique, I believe I owe it to readers and bloggers across the blawgiverse to help unmask the man behind the unseemly secrecy shtick. 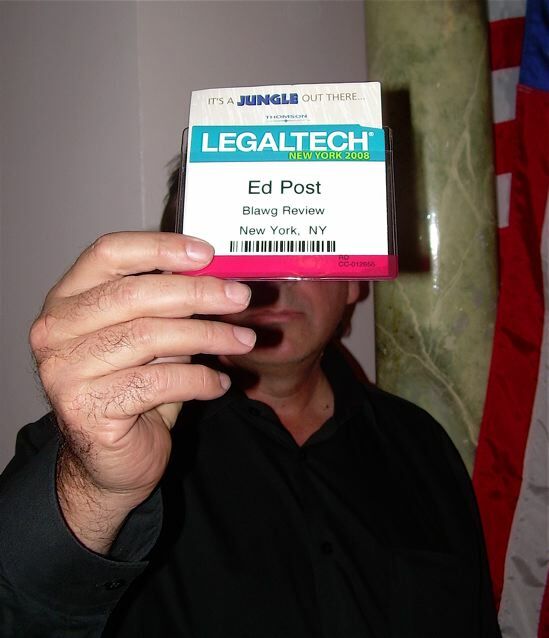 In addition to this Law.com headline: “EDD uncertainty looms over LegalTech,” the frustration of weblogging lawyers who encountered Ed at LegalTech NY this week can be seen in posts by Robert Ambrogi at Lawsites (“Sighted: Anonymous Blawg Review Editor,” Feb. 7, 2008) ; Eric Turkewitz at New York Personal Injury Law Blog; (“Anonymous Blawg Review Editor Spotted at ALM’s LegalTech Trade Show,” Feb. 6, 2008); and John Bringardner at LegalBlog Watch (“LTNY 2008: Anonymous Blawger Sighting“, Feb. 7, 2008). Because the complete drawing depicts a dramatization of a felonious action that is a bit spotty in my memory, and may not have occurred exactly as shown, I’m only including a mug shot of “Ed Post” in this posting. Our hope, of course, is that someone out there will be able to make — perhaps aided by the profile and chin shots taken by Bob and Eric, and some high-tech facial recognition software — a definitive identification of the man known in the blawgisphere as Ed of Blawg Review (f/k/a Ed Post). Please let us know, if you can help in our effort. Anonymous comments shall, however, be ignored. No, it wasn’t me. I was snowed in in Milwaukee, and even on my best days, I don’t begin to measure up to Ed. Talk about undue modesty! Thanks for dropping by my weblog, Anne, even if you didn’t make it to my neighborhood. Dear “webnews” a/k/a Daniel Wallace, Thanks for stopping by often, with kinds words, and for honoring us with a Blog Roll listing at SEO Crimson. As you might have noticed, I do not have and have never had a Blog Roll here at f/k/a, so I cannot reciprocate on that score. But, I urge readers interested in issues such as “search engine opimization (SEO), search engine marketing, technology and the Internet” to check out your weblog.